The first production of the Type 73, known as the Mitsubishi Type 73 Light Truck (Kyū) (73式小型トラック (旧) 73-shiki kogata torakku (kyū)?) was based on the Jeep CJ-3Bs that Mitsubishi Motors had been producing under license from Willys. 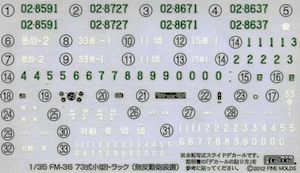 The first Type 73 Kyūs had been placed into production in 1973 with the chassis of the Jeep CJ-3B for basis before they made modifications based on it to create the Mitsubishi CJ-3B-J4 and the Mitsubishi CJ-3B-J4C before it was replaced again by producing the Mitsubishi CJ-5A-J54A. Production continued on before it ended in 1997 after the Type 73 Light Truck Shins were placed in production by 1996. The Kyūs had been exported out of Japan, mostly declared as military surplus vehicles to the Philippines and South Vietnam with the latter using it as one of the main jeeps of the ARVN next to the Willys M606 and M38A1s in the course of the Vietnam War. They had been exported to New Zealand for civilian use. 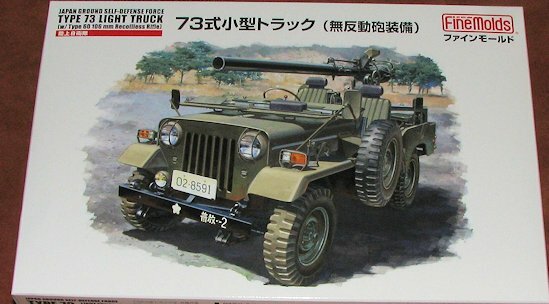 To my knowledge, aside from perhaps a resin kit, this is the first time a Korean War era Jeep has been done. Typical of Fine Molds, the detailing is superb, as it should be with 163 parts. You might expect a full engine in this kit, but that is not to be. You do get a lower engine section to fit to the underside of the one-piece body. There is also a full one-piece frame to fit to the underside. To this will fit all of the suspension, drive train and the exhaust. Since this is a Japanese built vehicle, it is right hand drive, something one might find to be a tad different. There is no option to do a left hand drive version as the body floor has certain lumps and bumps in it that would make that difficult to do. You get a full interior with decals for the instruments. This vehicle is set up for the recoilless rifle. This means no back seat, though they are on the sprues. Instead a channel for the big wheel on the rifle's mount goes in the center with simple platforms on either side. On the left rear is a small and rather uncomfortable looking pad for the gunner. Once you build the gun and mount, the rear portions of the mount will be attached to the back of the vehicle. The gun itself can traverse in both azimuth and elevation. Back to the vehicle, the plastic tires/wheels are a two part construct with the back side of each being a separate insert. The vehicle's windscreen has a notch in the top of it to hold the gun in the travelling position. Should you decide to display it in the operating mode, the windscreen will need to be constructed flat against the hood. It is either one way or the other and separate hinges are provided for your choice. The kit also includes all the various things hanging off these sorts of vehicles like rear view mirrors, fuel cans, a spare tire, headlight covers and the like. 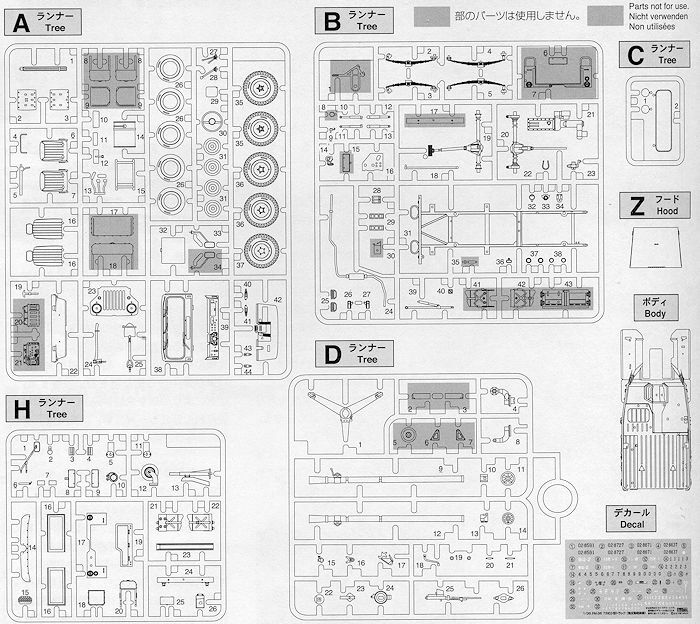 Instructions are very well done and have what appears to be Gunze, Humbrol and Tamiya paint references. There are decals for four similarly painted vehicles. One from Champ Hisai, Camp Zentsuji and two from Camp Takigahara, the latter being the Infantry school. Decals are nicely done and are basically just serials and data markings. Extra numbers are provided if you wish to do a different one than is shown. One thing for sure, this is something quite different from the norm when it comes to light trucks. The right hand drive and recoilless rifle adds some interest to it. It would be right at home in any collection or perhaps a Godzilla diorama!